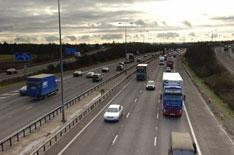 M25 to Tyneside: motorway all the way | What Car? A 24-mile section of the A1 dual carriageway is to be upgraded to three lanes, as part of a Government initiative to provide a motorway link between the M25 around London and Tyneside. Transport Minister Ruth Kelly said: 'The A1 is a vital route for the North-East. The improvement will provide drivers with a seamless motorway link all the way from Newcastle to London for the first time. She claimed the scheme would relieve congestion, improve safety and accessibility, and make journey times more predictable, boosting the North-East's economy and residents. The road will be widened in two phases. Construction of the southern section, from Dishforth to Leeming, will commence this autumn. Work on the northern section, from Leeming to Barton, is expected to follow in 2011. No finishing date has been set.